Thank you, Batdorf and Bronson! I began working on the business plan for Tazza D’Oro 12 years ago. One of the main components of the plan was to find an exceptional coffee roaster. At that time, I was traveling weekly for my job and would spend evenings and weekends tasting coffee and visiting roasters, including 2 places in Canada. After more than a year and a few months before our opening we had a few coffee roasters to pick from but not exceptional coffee roasters. While having lunch in the Farmer’s Market in Olympia, a friend said have you “tried those guys”. She was pointing to the Batdorf and Bronson Roastry just behind the market. I got up from the table and the rest of the story for the last 10 years you know. From my initial visit that day to today, I can’t say enough about Batdorf and Bronson and all the employees who work there. Their exceptional coffee, training and customer service helped make Tazza D’Oro the success we are today. Finding and choosing a roaster 10 years ago was hard and making the decision to change roasters for the next 10 years has been, well, excruciating on many levels. 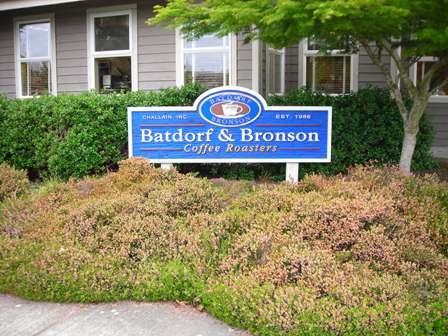 Batdorf and Bronson is a company of amazing people who love coffee. We are grateful to them and even more grateful for the continued friendships! Back atcha, Amy. Doing business with ETDO for the last decade has been pretty darn swell from this end too. I am grateful that you were able to visit us and to get to know us as more than voices over the telephone. You will be always welcome here in the Pacific Northwest. Come in the summer to enjoy the weather with us, or come in the winter to brighten our grey days with your smile. Anytime, dearie. Anytime at all. I think that I still owe you a song, don't I? Thank you Doc. Yes you do owe me song and yes, I WILL be back to visit the Northwest!